They call the correct color Brewster Green its almost its a little darker than oliver green I painted both of my Rumelys with a mix I did myself and I used oliver green and put some black in it. They turned out real nice. I have a 6A and a 1919 16-30H oil pull.Magneto guy I had mine totaly rebuilt last year for 800 bucks,Amish guy in Ohio did it for me,cost alot but the thing runs great. 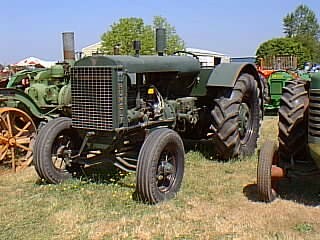 I am looking for the correct green color for a rumely 6.Any information on paint codes would be helpful. Looking for parts.Rumley Six 6 cylinder. Need front wheels, Engine gear chain, and possible other parts. Do you have these or have information where to get these parts ASAP. Telephone number 406 232 2070 Collect if nnecessary.. Thanks! Was looking for information on the color and details of the rumley 6, also wondered the value of such a tractor, aquired one last year and wondered these questions. Thank you! Sunday 16 June 2002 My brother and I own a Rumley 6,would love to hear from any other owners in England or abroad. HI, I have a rumely 6 that I am starting to restore and need some parts. My dad and I have an Advance-Rumley 6 that is in restorable condition. I would like any information on original colors, where I can find parts, ets. I would really appreciate any information about this tractor, so that I may restore it to near-perfect condition.